Train your mind….and your feet will follow ! If knowledge was everything…we would all be billionaires who ran like the wind…but knowing is not everything. We are…what we consistently do with our knowledge! My last piece spoke about The Chi running Technique – knowledge. This and the next one will tell you how to practice Chi Running during the session and over the season – consistent practice makes perfect ! Chi Running is all about mindfulness and creating the flow of energy and movement in your body. Look at any gifted sportsman – Roger Federer, Tiger Woods, Mo Farah or Virat Kohli – they all make it look it so easy and effortless ! It is because they are totally focused in the moment, the perfect effortless movement has been honed millions of times…and when the time to perform comes – they are a focused mind and a responsive body ! Danny Dryer in his book, ‘Chi Running: A Revolutionary Approach to Effortless, Injury-Free Running’, says “Chi Running is about having a constant conversation between your mind and your body, getting your mind to train your body to relax, and listen to what your body trying to tell you”. Effortless running is about relaxing muscles, opening tight joints, and using gravity to do the work, he says. Here is how to do it on your next run. Focus Your Mind – All victories are first won in the mind and then on the battlefield ! The Evening Prior. Think about your next run during the evening prior to it. What is that you want to achieve ? This one thought sets into motion and automatic series of events – you eat healthy, you hydrate, sleep on time, prepare your gear, call up your running buddy, check the weather, etc ! You are setting yourself up for success. Visualisation Before the Run. Visualise your run as you get ready and prepare for the run. Think about your warm-up, your running posture, the effort, the running bliss, the feeling of finishing fresh and strong and the post run banter ! Remember Usain Bolt plays each of his runs in his mind a hundred times before he actually burns the track ! During the Run. This is the hard part. The actual conversation of the mind and body during the run. Be acutely aware of each motion of your body without making any changes. Look for tension in the muscles and impediments to the flow of movement – tell your body to relax ! Check your Chi Running form again and again (what to check ? Look below)….but you say, “My mind wanders all the time !” A easy hack – set your watch timer to beep after every five minutes timer – Do the Chi Running scan and then back to enjoying the surroundings or banter with your friends or whatever. Post Run. A post run analysis is vital to track your progress and make amends ! Enough said ! Body Sensing – Listen to your body and make your body listen to you ! Starting the Run. Start slow. Get your running posture and technique in place before putting the speed/effort. Remember the cheat sheets from my previous article. During the Run. Checking your running form every five minutes or so. Focus on one set only at a time. Breathing – Tap into your source of energy ! Breathing is at the core of many Eastern disciplines, such as yoga, tantra, chi gung, and meditation. Breathe well and you will have the energy to run ! Most of us have poor breathing due to low aerobic capacity, shallow breathing, poor posture and tense muscles. Chi Running says – have a tall posture, breathe deeply from your diaphragm and relax your body to see good results. The long slow distance run and the practice of Pranayama can greatly enhance your aerobic capacity. For advance runners, you could practice inhaling for two steps and exhaling for three to create balance in breathing. The trick is to ensure that you inhale/exhale every time on a different footstrike ! Chi Running is the thinker-runners domain. There will never be a ‘Chi running for Dummies’. The closest thing is the paid Chi Running app on Google Play and itunes . Pretty effective. I have used the Android version. Includes lessons as videos and helps conduct a guided run. Recommended for those who want to try out some serious Chi running. Chi Running is not easy to understand. But it gives great pleasure and satisfaction once you have mastered it. For this reason take your time to read, experiment and practice. I’ve discovered that the body and mind learn best through repetition. 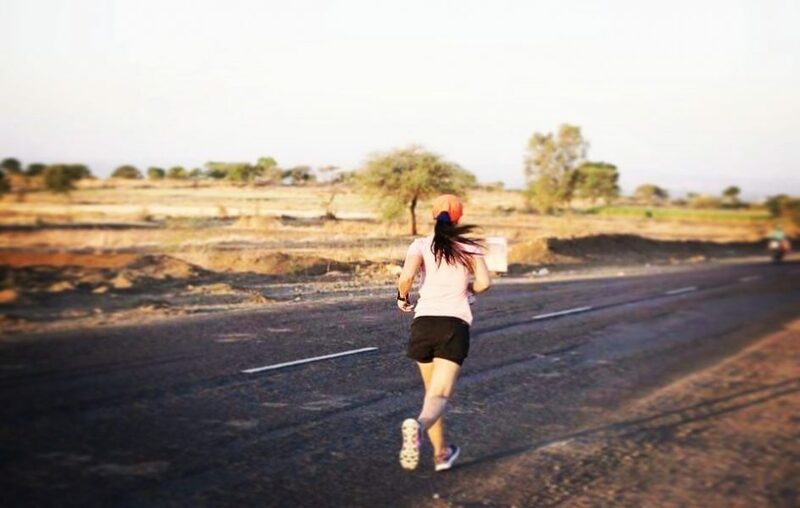 Learning the basic Chi Running technique can take anywhere from one to three months for the average runner, but the greater knowledge gained from the approach will be something that, when practiced regularly will influence your thoughts and actions for the rest of your life ! Coming up in my next blog – how to practice Chi running over the season culminating into a PB in your planned race in NOVEMBER 2017 ! Chi Running is an amazing practice. It takes us back to the roots of running. The desire to run. The pleasure of it. Running becomes a special state : a place of air, gravity, earth and the runner. Thanks. We would love to hear your feedback. Looking forward to your feedback ! Chi Running has brought a major difference to my running. My Shin Pain that wasn’t going even after numerous medicines or physiotherapies just disappeared. I totally connect with all the logics stated. I knew it wasn’t the shoes or anything… it was the running form and I was doing something wrong. Thanks GS.